Reini has a very deep love of squirrels. I remember him visiting Elon and being in awe of all the squirrels running around, up and down the big oak trees. Whenever he visited me in Marietta my daddy would place some peanuts around the yard to coax the squirrels into view. 🙂 Sadly, there don’t seem to be as many squirrels in Austria. Whenever we’ve gone on our hikes or nature walks, I’ve never seen a squirrel. 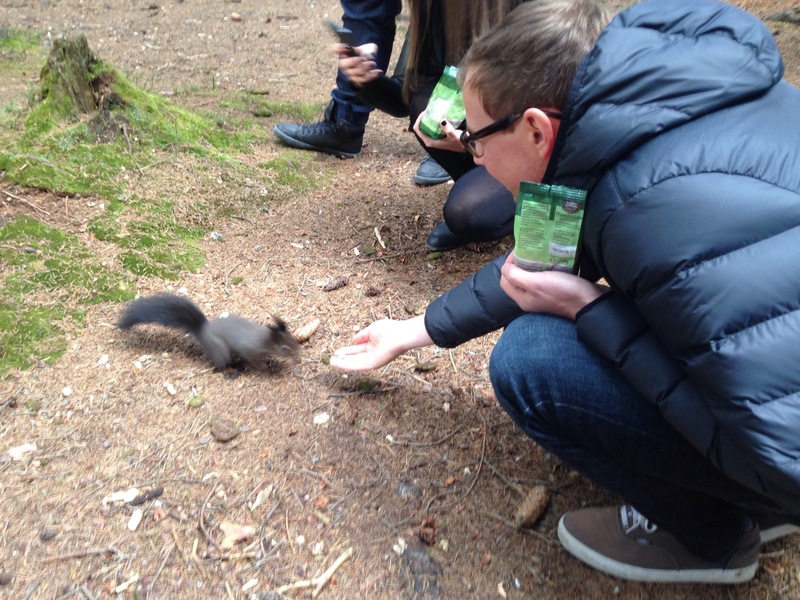 So when Reini’s friend Hannes told him of a special park where squirrels will eat nuts out of your hand just outside of Innsbruck, we had to go. We went with Hannes and his girlfriend Bianca to find the little friends. Sure enough, we offered the squirrel some hazelnuts that Bianca brought and they came running to us. These squirrels are not like Georgia or North Carolina squirrels. They are way cuter. 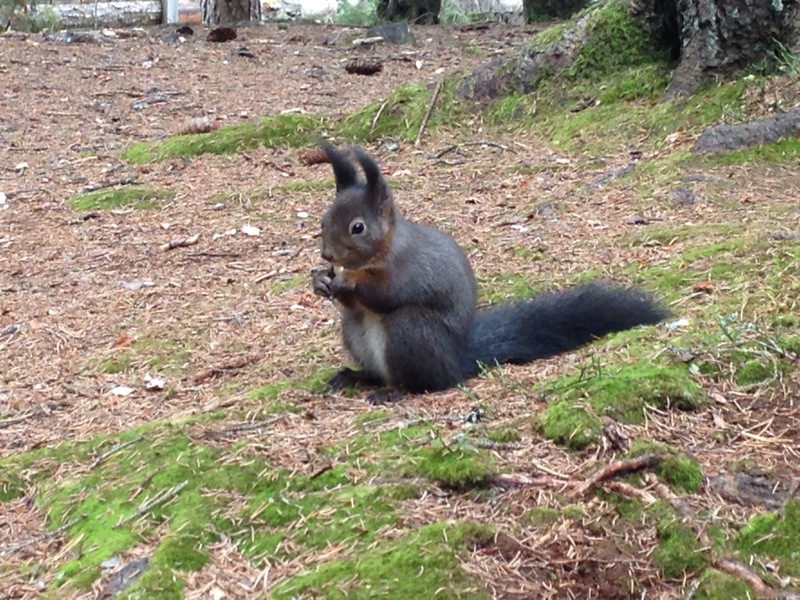 I guess alpine squirrels need extra fur because they are so fluffy! They even have long ear fluff! Reini was in heaven for sure! 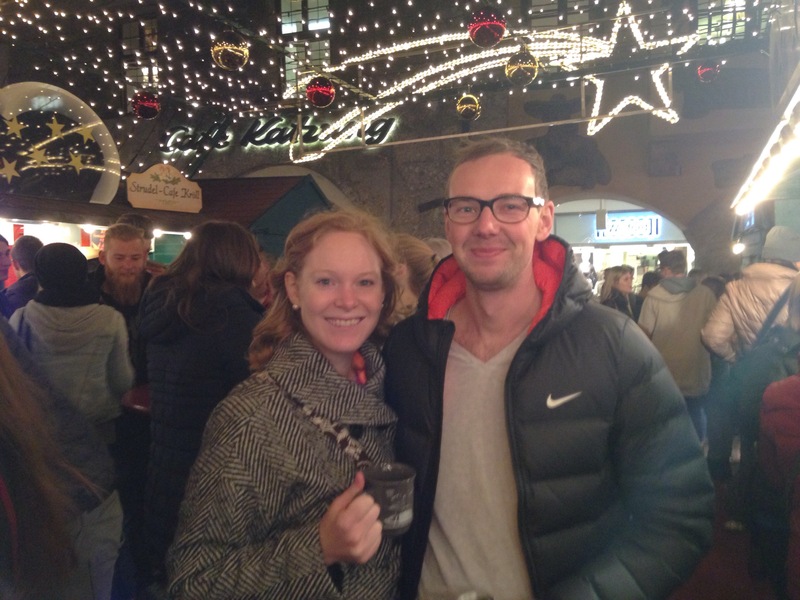 That evening we went with Hannes, Bianca and some of her friends to the opening day of Innsbruck’s Christmas markets! Some musicians played their horns from the famous golden roof and there were some light up angel ladies walking through the market. We got to enjoy our first glühweins of the season. Yum! I was just excited to see all the pretty Christmas ornaments and other handcrafted things for sale. Reini wrote his Christmas wish to the Christkind (he asked for a squirrel) and put it in his mailbox (like American kids write to Santa). One of the giant trees was sponsored by none other than Swarovski. It sparkled like crazy over one of the glühwein stands. Just a magical start to the season! I had been dreaming of going to the Christmas markets in Innsbruck for a while, so visiting them this year was a requirement. Reini and I met up with one of his good friends, Hannes, and his girlfriend. We strolled through the markets, glowing with lit trees. We stopped for some glühwein, and I picked up a few presents to bring back for friends at home. Reini made the suggestion that we climb up to the top of the church tower. There we got the best view of the markets and city below. After climbing back down, we were about to head back to our cars when we saw a lot of people gathering to the sides of ropes in the street. A little perplexed, the locals knew immediately what the people were waiting for. The Christ Child was soon to arrive! We ended up witnessing a grand parade thorugh the streets of Innsbruck. There were a couple marching bands, people riding horses, children singing, and a group of sheep all trotting down the street. Instead of having Santa sitting in a sleigh at the end, there was a young boy in a sparkly white outfit waving to the crowds – the Christ Child. If you remember from my last post, the Christ Child is the one who brings Austrian boys and girls presents, not Santa, so this is a big deal for the kids. Another night, Reini, Kathrin, and I went to the town of Kufstein for their Christmas market located at the top of their fortress/castle thing. Their market was crazy! It’s located partially in the fortress and partially outside. The inside part was very long, winding aroud through stone tunnels – so cool. There were a couple areas for kids’ crafts, but it was mostly filled with little vendors, selling beautifully hand crafted items. I, of course, had to buy a couple of things to bring back home. After the inside portion, Kathrin, Reini, and I enjoyed some glühwein and listened to a brass ensemble play some Christmas tunes before we headed home. Reinhard’s Christmas surprise for me was a trip to the Mittersill Castle in the Salzburg region. This castle brags about its 900+ years of history, overseeing the trade and tax collection of the region. Now it is a restaurant, spa, and hotel. It is beautifully remodeled inside, with furniture that looks as if it were from the 1800s. We enjoyed exploring the grounds and later partook in the most delicious 4 course dinner. Reini and I fel like royalty. We wandered down to the town below, named Mittersill for the castle overlooking it. The town had sparkly Christmas decorations lighting our way. The evening culminated in a cafe, me enjoying a hot chocolate and Reini a cappuccino. 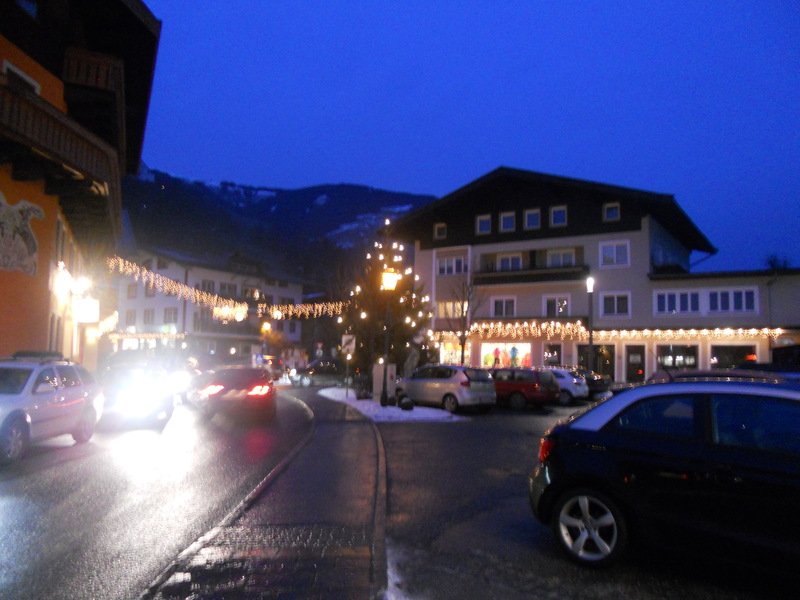 The next day, Reini took me to my favorite Austrian city, Kitzbühel, to see their Christmas market! We walked through Kitzbühel and stopped for lunch in one of the bistros along the way. The market was so lovely. Austrians were sipping their glühwein and eating gingerbread hearts. I enjoyed browsing through the stalls filled with handcrafted items, most of which were Christmas decorations. I wish I could take everything home with me! Before heading back to Tallinn, Reinhard and I made a quick stop in Riga. We were supposed to get into town in the early afternoon, but with a delay in our flight, we missed all daylight. Considering how the sunsets at like 3:30, though, we still had all of the evening to explore. After checking into our wonderful hotel (I’d totally recommend the Hotel Centra Riga), we headed quickly to find some food. We stopped at a café and really enjoyed our food (it helped that we were starving). Reini got a delicious pasta dish and I scarfed down some potato pancakes (popular in Latvia) with a chicken fillet. With full bellies, we went out to search for the beautiful sights of Riga and to do some Christmas shopping. Riga seemed to have multiple Christmas markets. We found at least one open one and another one that was being set up. I learned from my last trip to Riga (January 2011) that the popular thing to buy in Riga is amber. This time I sought out to get some nice amber things that I had been wishing for since my last visit, and some of you might find some little amber things from me under your Christmas tree 🙂 But there were quite a few shops open, and Reini and I picked up a few things. We warmed up with a couple glasses of glühwein at the Christmas market, too. The night was really cold and rainy, so after regrouping in the hotel to mark the map for with things we missed, we went back out to find a place for dinner and to check off our remaining must-see buildings. We got a bit lost trying to find the I Love You bar (recommended on the internet for having tasty, inexpensive food), but we eventually found it and munched on a pizza while drying off and warming up. The cold weather had gotten the best of us, however, and we made our way back trough the town to get to our hotel. Riga was a quick trip, but I’m really glad I got to go for a visit. If nothing else, I was able to get a good part of my Christmas shopping done!